5 1/2 in. x 8 1/2 in. 4 1/4 in. x 11 in. 8 1/2 in. x 11 in. 8 1/2 in. x 14 in. 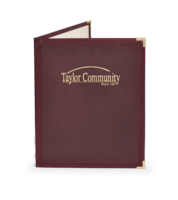 Double Pocket Imitation Leather Menu Covers with sewn edge binding. Two clear pockets have been sewn to inside lining, 60 pt. semi-rigid, leather embossed vinyl outside, both double row stitched to binding. Pockets open along center seam. with outside back cover also clear, to make a total of three viewing panels. Add $95.00 one time charge to add your personalized imprint to front cover. 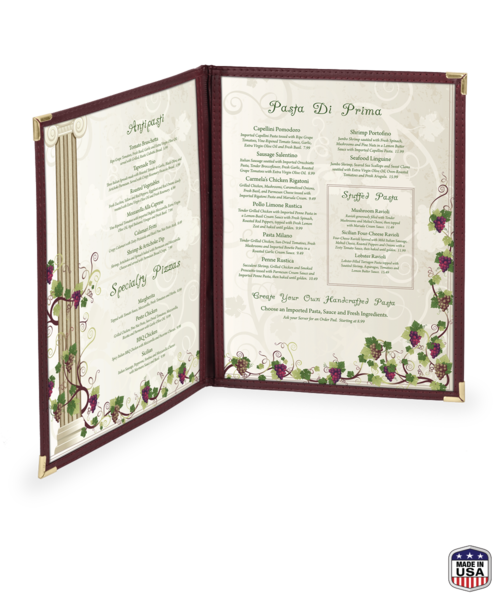 These menu covers are made to order. Please allow 10 - 15 working days for manufacturing. HOLDS TWO SHEETS IN INTERIOR CLEAR POCKETS ON LEFT AND RIGHT SIDE. 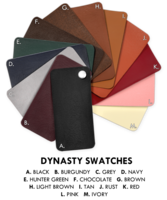 FRONT AND BACK COVERS ARE MADE OF FLEXIBLE, IMITATION LEATHER. BACK PANEL MAY ALSO BE MADE CLEAR FOR 1 ADDITIONAL VIEWING AREA. SIZES SHOWN ARE FOR INSERTS THAT FIT INTO MENU COVERS. ACTUAL MENU COVER SIZES ARE LARGER. Select Size5 1/2 in. x 8 1/2 in.4 1/4 in. x 11 in.8 1/2 in. x 11 in.8 1/2 in. x 14 in. Double Pocket Leatherette, Sewn Edge Menu Covers with two clear pockets sewn to inside lining, 60 pt. semi-rigid, leather embossed vinyl. Shop online with the Menu Shoppe today.